Raise the awareness of human rights in your community and help make human rights a fact. For those that would like to do something about it, this information kit provides tools to help you do so. 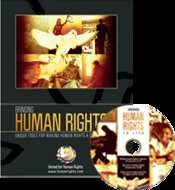 It includes a free DVD giving the history of human rights along with 30 public service messages demonstrating each of the 30 articles contained in the Universal Declaration of Human Rights.